My daughter (who is a food person also) constantly tells me about the Funky Cow and how good the food tasted. 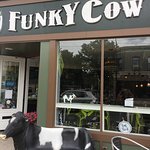 I finally found my self in Hammonton, and there at the corner was the "Funky Cow". I walked in and was greeted by a warm welcome. I explained it was my first time being there. There is a limited posted on the wall. I was told that the Cuban was excellent. I ordered it and enjoyed the way the Café was presented. 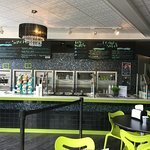 I had the privilege of meeting the owner and we had a very nice chat. I paid for my Cuban and left, On the way home I could not resist taking a bite. My goodness all the flavors that made up the Cuban washed over my tongue and taste buds, This mixture was great. I enjoyed half of the Cuban and waited for other have when I got home. Then I had the time to savor all the mixes of this Cuban. I called my daughter and made a date for the both of us to go back and enjoy the rest of the menu. Very nice job. 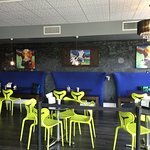 I took my husband to lunch at the Funky Cow for the Cuban. He absolutely loved it. The chicken salad is also a must have....so delicious. Ricky, the owner is so welcoming and friendly. Don’t forget dessert, also wonderful! Love, Love,Love the Funky Cow! I have never seen a waffle forward restaurant before visiting hammonton on a business trip. So I had to try. I had the Cuban which tasted like a classic Cuban but on the waffle. The waffle was crispy and really held up to the ingredients inside. It was awesome. The staff or maybe the owner was super friendly and took time to explain the menu and ensure we were happy. The decor was also nice in an artsy way with the cow theme. I will have to visit again and save room for some dessert! 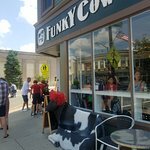 My husband and I just had lunch at the Funky Cow Cafe after driving past it for the last couple of months. It was such an unexpected treat. The menu offers sweet and savory waffle items. The waffle sandwiches were delicious! Head and shoulders above any chicken and waffle concept I’ve experienced. The staff were friendly and helpful, and the decor and vibe were delightful. We did not try the sweet waffles this time. Looking forward to our next visit so we can sample more of their offerings. We had lunch during our first visit to this wonderful little restaurant on the main shopping street in Hammonton. We were greeted at the door with: "Hello, friends". That was our first indication that this place was special. they make amazing savory sandwiches on waffles. The Cuban sandwich was incredible. They also have dessert waffles which are equally delicious. Ricky, the owner, is so friendly and shows his love and pride of his restaurant. We will be back soon. Been to Funky Cow Cafe? Share your experiences!